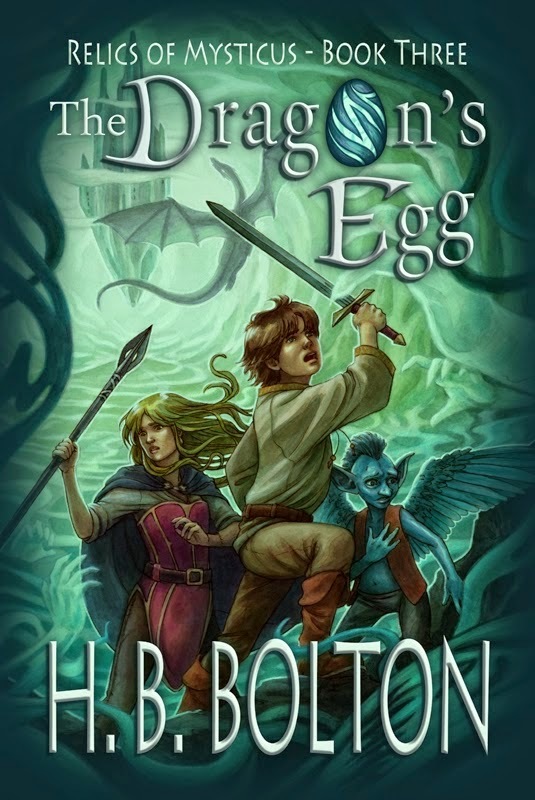 DJ's Book Corner: Dishin' It Up with @H_B_Bolton, author of The Dragon's Egg + #GIVEAWAY! 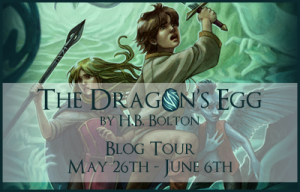 Dishin' It Up with @H_B_Bolton, author of The Dragon's Egg + #GIVEAWAY! Today we welcome H.B Bolton to DJ's Book Corner. Thanks so much for swinging by to dish it up with us! I’m happy to be here. Thanks for inviting me. Tell us what you want us to know about The Relics of Mysticus series. The series invites readers to travel throughout many different mythological realms, where they can experience magical food, chivalrous dragons, cunning mermaids, mischievous fairies, Steampunk robotic animals, and powerful wizards. Sum up Evan and Claire, the series MCs, in three words. If The Serpent’s Ring were a movie, what would be the perfect first song on the soundtrack? Who should I give props to for the “sketch” concept for your book trailers? They’re awesome! Thanks, I’ll take the “props” for it. Each of my chapters come with an illustrated header. I simply plucked a few and inserted them into the trailer. I sent a script to Maxwell Glick, and he brought Evan’s voice to life. Each book cover represents a different Earth element: The Serpent’s Ring = water, The Trickster’s Totem = fire, The Dragon’s Egg = air, and The Mummy’s Amulet = earth. I made sure to incorporate the appropriate elemental quality with each trailer. 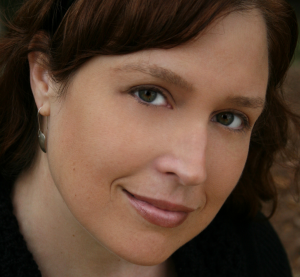 What do you like best about writing middle-grade fantasy? I love being able to bring legendary creatures to life and having them interact with my characters. I also enjoy building worlds for my characters to explore. I listen to music while updating my online posts. But as soon as it’s time to write, I have to turn it off. I can’t concentrate if I’m listening to lyrics. I also can’t go anywhere near a TV when I’m writing. 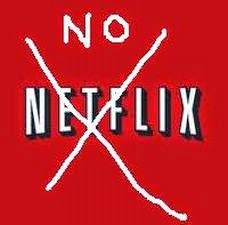 I could easily become hooked on watching one of my favorite movies or an entire television series on Netflix. Maybe Through the Looking-Glass, being that I’m a curious person and enjoy seeing what’s on the other side or around the corner. Besides, like Alice, I have fun imagining I’m in a fantastical place. I’ve visited many schools where I was able to speak with students. It warmed my heart to see their faces light up with excitement about an aspect of my stories. I also enjoyed watching them try to decipher what will happen next. If you were the captain of a band of pirates, what would the name of your ship be? Pride of the Realms. Love the name, H.B.! A magical part of H.B. Bolton’s childhood was being swept into worlds of enchanting characters, fantastical creatures and extraordinary powers—simply by picking up a book. As a mother and a teacher, she was compelled to create imaginary worlds of her own in order to share them, not just with her children, but with all children. H.B. Bolton lives in Florida with her supportive husband and two highly spirited children. Shh, can you keep a secret? Not only does she write books for the young-at-heart, adventurous sort who yearn to dive into a good young-adult fantasy story, she also writes spellbinding, heart pounding women’s fiction. These particular books are written under the name Barbara Brooke, but that’s another story, altogether. Inside the castle’s glass tower, Emrys sleeps in an eternal slumber, and Evan’s uncertain whether he can save the great wizard. Especially now that Emrys’ former student, the Lady of the Lake, has joined forces with the cunning immortal Alamaz. Together they have already stolen the Dragon’s Egg, but their greed doesn’t end there. The Siren’s Pearl calls to them, and that means only one thing … Atlantis is in trouble. Join Evan, Claire, and Dunkle — along with a few other unlikely heroes — as they travel across the realm of Medieval Legends, float through the Ancient Isle of Avalon, plunge inside the Dungeon of Dreadful Dreams, and be there when Atlantis rises once again. 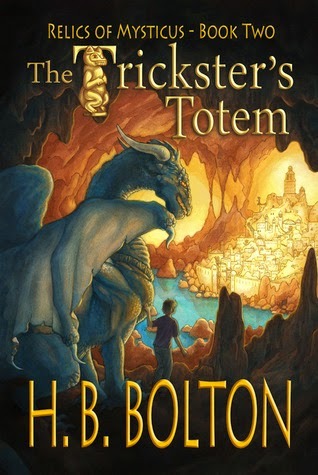 From June 4 to June 7, Trickster's Totem, Book Two in the Relics of Mysticus series is FREE! You could win a $25 Giftcard, print books or eBooks from H.B.! Kids, dragon, action and fantasy in the same book? What a treat! The interview questions were fun to answer. Although, I'm still considering what the perfect opening song would be :) I was also thinking that 'The Lazy Song' by Bruno Mars would be perfect, but there's one lyric that wouldn't work for kids. Bummer. Anyway, thanks for inviting me to your site. Can't ever go wrong with Bruno Mars! But it was my pleasure. Thanks for allowing me to interview you! Thanks so much for hosting a tour stop and interviewing the author! It's always fun to learn more about her. I can't write to music with lyrics either, but it works to set my mood before writing.